If you own a recreational vehicle, chances are that knowing a few camper repair tips will come in handy from time to time. Families have been enjoying campers to take on road trips since the early 1950s. Campgrounds all over the United States make it convenient to travel with your camper and stop for the night. A camper also refers to a pop up tent trailer, a recreational vehicle, a trailer, or just the shell on the back of a camper truck. When something breaks on your camper you need to decide if it is something you can fix yourself or whether it requires a professional. 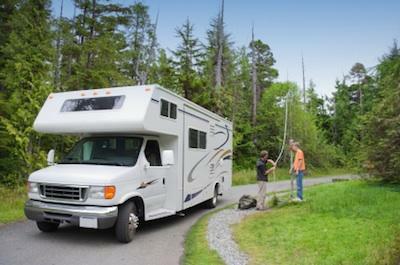 You should understand the essentials of camper repair in order to fix the camper on the road. Following is a list of tools and emergency supplies that should be packed in your camper before each trip. Maintaining your camper to prevent leaks is preferable to fixing a leak later or being miserable on a rainy trip. There are products to apply to the roof of trailers, campers, and RVs that will seal and prevent roof leaks. If you already have a leak, wash and dry the area and apply silicone or a specialized liquid rubber roof repair over the leak and while you are at it, seal around vents and flashings. If the upholstery is dirty, see if you can remove the covers and take them into the dry cleaner to clean. If the cushions are still firm, but the upholstery is worn thin then you can replace just the upholstery and re-use the foam. The foam on the beds can be re-covered with a futon bed cover. Futon covers can be bought at most department stores. If you are handy with a sewing machine you can recover seat cushions fairly easy. Purchase upholstery and heavy-duty thread. Keep the old cushions and take them apart at the seams. Use these as a pattern for the new covers. One of the easiest camper repair tips is replacing the vinyl floor. This is a job you can do yourself. To replace the vinyl floor, remove the lifting or peeling vinyl. Sweep and vacuum the under flooring. Replace the vinyl with peel and stick vinyl tiles. Start in the center and work your way out to the edges. Depending on the size of your camper, you may or may not be able to fix a flat tire. RVs or trailers that are very heavy should only have the tire changed by a professional. Most heavy trailers do not come equipped with a tire jack because they are too heavy. If you travel a lot in your trailer it is important to have roadside emergency service such as Good Sam or AAA. If you have a small trailer that is not loaded, you may be able to jack it up and replace the tire yourself. Camper refrigerators run either on propane or electric or both. If the refrigerator is running on propane gas the delicate flue can get covered in soot or come loose due to road vibrations. When this happens, the small flame that affects the amount of heat that operates the cooling unit gets interrupted. Use compressed air to blow out any soot or grime on the parts. Carefully clean the parts with a toothbrush dipped in rubbing alcohol and allow them to dry thoroughly. Camper repair tips can go a long way in saving you money or getting you out of a camping nightmare if something should go wrong on the road.